Sure, there are a ton of ipod touch apps out there that will let you play your favorite instrument along with just about any song you want, whether you’re a rookie or a novice. But, what about iphone apps for those that want to create their own music? In the way of sheet music, placing the different notes, and creating a completely original song? Well, for those composers who have so far felt left out of the “music creation” app hype, never fear. 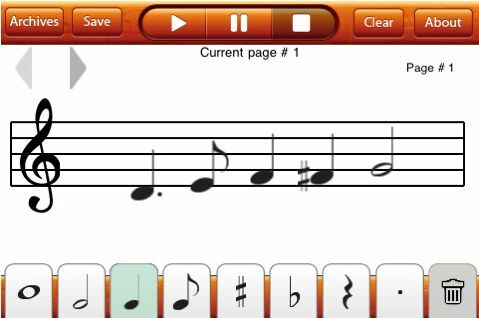 If you are dying to create sheet music on your iPhone – there’s an app for that. Music Drawing Lite iphone app, just like other musical instruction apps, is great for both those who want to learn how to write their own music, as well as those who already know about making music, placing notes, and just want to get going creating their own album! Beginners will learn all about very important musical components such as pitch and its relation to the staff; sharps and flats; note duration; and note recognition. If you already have a pile of sheet music in their hands, or in your head, you can get it all down into your iPhone and download it to your computer or put it on disk. Imagine listening to your own creations being played back to you! Beginners will definitely love being able to hear their own music being played directly back to them. And those who are already music geniuses will now have a place to store all those original songs. Music Drawing app for the iPhone is a free version of Music Drawing, and it does have most of the features that the full version does. It also does ask you repeatedly if you want to buy the full version, which can get somewhat annoying. Especially when you’re in the middle of a great jam session! Download this Music Drawing App for iphone or ipod touch Here!